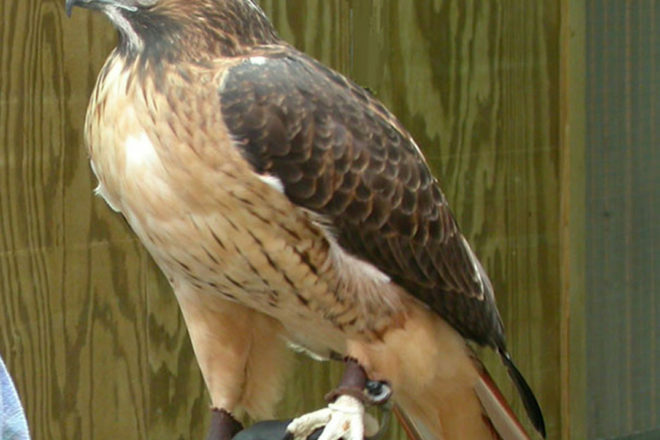 A captive red-tailed hawk has pale breast feathers with dark brown barring at its belly. Photos by Roy Lukes. I occasionally see a red-tailed hawk sitting on a power pole or on the electric wires along Highway 42 about a mile north of Carlsville. These birds used to be more plentiful, as were other large hawks, but their numbers have decreased during the past few decades. The red-tail is the most common open-country hawk, and some stay in our area all year. The word buteo (BYOU-tee-oh) is the Latin name for the common buzzard in Europe. It refers to the group of medium to fairly large raptors with broad wings and a relatively short tail. They are the ones most often seen soaring high in the sky, sometimes in large flocks when they’re migrating. The most common buteos in our area, from largest to smallest, are the rough-legged (here only in winter), red-tailed, red-shouldered and broad-winged hawk. All but the rough-legged nest in Door County. On clear, sunny spring days, the earth warms, and this rising air, called thermals, are what these large hawks use to climb to greater altitudes and then drift downward as they move ahead in their migration north. In autumn, these hawks take advantage of large cold fronts moving down from Canada to help their southward migration. Hawk Mountain in Pennsylvania and Hawk Ridge in Duluth, Minn., attract many birders during these peak migrations in mid- to late September. I remember when Roy and I were leading a Wisconsin Society for Ornithology pre-convention tour of northern Door County and Washington Island many years ago. It was mid-May, and there was a huge flock of broad-winged hawks heading north. We watched as they clustered near Washington Island, and then they turned back south and followed the western side of the peninsula, back where they had come from. These migrating hawks use the thermals. However, when they encounter great expanses of open water, they lose the thermals and must seek continuous land to aid their travels. Its rusty red tail is displayed in this back view. What would you guess to be the most abundant mammals in Wisconsin? They are the little-known mole shrew and the field mouse. When we conducted our southern Door Christmas bird counts, for many years we had high numbers of red-tailed hawks and rough-legged hawks. The count circle has numerous fallow fields that used to be planted with agricultural crops. Now these abandoned properties are rich with mice that provide great food for the large hawks. Meadow mice can damage young trees by girdling them, and they can consume vast quantities of hay, corn and other crops. What’s more, these small mammals are quite prolific. At the age of 25 days, a field mouse is old enough to breed. One pair of these mice is capable of having 17 litters per year, each litter averaging five young. The potential offspring from one pair of meadow mice in one year’s time could be more than a million mice if you include the original breeding pair’s offspring and the three following generations, assuming that all the mice survived and bred to capacity. It is rare that all would survive, but you can see how much damage could be done and what a great service the hawks do to keep them under control. The rough-legged hawks, down here from their northern breeding areas, display a wonderful technique of hunting over the fallow fields. They hover fairly high in one place while they scan the land for any mouse movement. Their eyesight is astoundingly keen, even from great distances. As soon as this raptor takes to the air, you can usually see the distinctly dark wrist markings on its lower wing surfaces and also the large, white rump patch. Actually, the bases of the bird’s tail feathers are white, making it appear from a distance to be a rump patch. What’s so impressive about these large hawks is the relatively small size of their feet, which are perfectly suited for grasping their most common animal of prey, the meadow mouse or other small rodents. All birds have two stomachs: a glandular stomach and a muscular stomach or gizzard. Some birds, including the hawks, owls, loons and cormorants, have a more efficient glandular stomach that gives off pepsin, an enzyme that may be highly acidic – enough to dissolve small bones if they remain there long enough. The gizzard traps the bones, claws, teeth, feathers and other indigestible matter, thereby preventing it from entering the alimentary canal. There, in the gizzard, this material rolls into an elongated mass called a bolus or pellet that is regurgitated through the mouth. In most cases, prey such as meadow mice are swallowed whole unless they’re torn into smaller pieces to be fed to the young in the nest. A pellet forms about eight hours after the prey is swallowed, and it is cast eight to 16 hours after the prey is eaten. 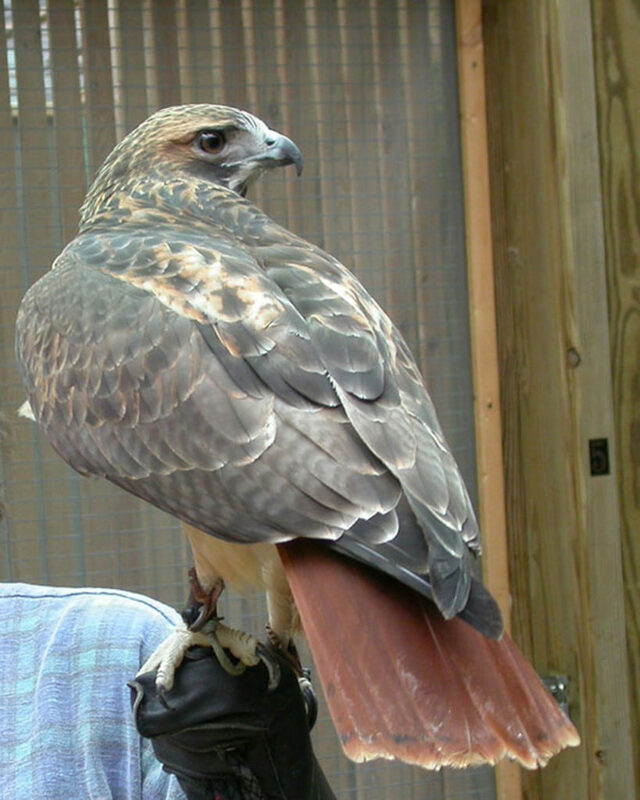 Red-tailed hawks could appropriately be called one of the leading members of nature’s sanitary corps. Around 65 percent of their diet consists of mammals considered to be injurious to agriculture. What a wide variety of wild mammals they are known to prey upon: shrews, gophers, skunks, raccoons, muskrats, porcupines, rabbits, weasels, mice, rats, chipmunks, squirrels, snakes, toads and insects. Young red-tails in the nest are fed a diet largely made of squirrels and mice. Should an adult red-tail in flight give you a good look at the upper surface of its tail as it banks, it is then that the bird’s real trademark – its brick-red tail – shows up so nicely. Seen from below, the bird’s tail is actually quite white. The red feature is acquired after the midsummer of its second year. Learn more about our buteos, and appreciate their help in keeping the small-rodent and meadow-mouse population under control.